Over the last couple of weeks I was involved in a Linkedin conversation (Chemical Process Engineers group) for the appropriate use of indirect bath heaters. The topic sparked my interest and I started exploring the uses of such systems in more detail. A number of experienced process engineers also commented on the topic and I have tried to incorporate as much of this as possible into the following summary. Indirect bath heaters are mainly used in the oil and gas industry to heat process fluids. The mechanism takes place indirectly through a bath (utility bath) as opposed to heating directly by flame or furnace (direct fire-tube heaters). The use of a bath promotes uniform heating and reduces the chance of hotspots. Hotspots often occur in direct fire-tube heaters as a result of carbon build up on the fire side of the tubes. If left unchecked this build up can be a source of process fluid degradation and may lead to ruptures, explosions and leaks (Green and Perry 2007). Due to the indirect nature of bath heaters the safety risks are much lower (combustible streams isolated) compared to direct fire-tube heaters, they can therefore be used in hazardous areas where safety is a concern. The “indirect” name comes from the fact that a fire-tube is submerged in a bath that provides heating through the bath medium to a submerged coil containing the process stream. Usually the bath fluid is water but depending on the climate and heating requirements it can also be oil (capable of heating process fluids to higher temperatures) or a mixture of water and glycol (used in colder climates to lower the freezing point). Typically indirect bath heaters should achieve around 50-55% heating efficiency. This relatively low efficiency compared to direct fire-tube heaters is a result of the number of heat transfer steps involved. In catalytic infrared fire-tube heaters for example, there are only two steps: 1 – infrared from flame to HX, 2 – HX to process fluid. 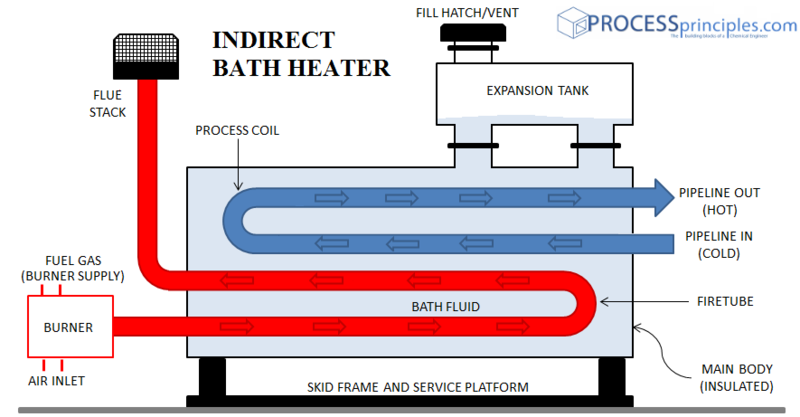 While indirect (fire-tube) bath heaters have four: 1 – heat from flame to fire-tube, 2 – fire-tube to bath fluid, 3 – bath fluid to process stream coil, 4 – process stream coil to process fluid. It’s also worth mentioning that a bath heater is slow to react to changes in the inlet stream temperature, mostly due to the large thermal capacity of the bath medium. Typically indirect bath heaters are used where the flow rate of the process stream is low and operations may be unattended, they could also be used to prevent coke formation on the tubes when low heat fluxes are required. Preheating of crude oil, heating of gas/crude at the well head (prevents cooling effect of gasses expanding), heating of high viscosity fluids to reduce pumping pressures, heating fuel gas at power generation sites, heating at compressor stations, fuel gas dew point control, heating high pressure hydrocarbon gas streams, vaporisation of process fluids and reboiler heating. Found some more information? Feel free to share in the comments section below. Manning, Francis S, and Richard E Thompson. Oilfield Processing of Petroleum: Crude oil. Oklahoma: Pen Well, 1995. Pietro Fiorentini. “Indirect Fired Heaters.” Pietro Fiorentini. 2010. http://www.fiorentini.com/media/files/503_systems_-_indirect_fired_heaters_-_eng_-_apr2010.pdf (accessed 08 2012). See GPSA Engineering Data Book Vol. II, 13th edition for details on indirect fired heater design and instrumentation. VERY GOOD explanation. can you please provide process design calculations for this. I will look into some design calculations but they are highly dependent on process factors. Your best bet would be to have a look in “Chemical Engineering Design: Principles, Practice and Economics of Plant and Process Design” by Gavin Towler and Ray Sinnott. See Chapter 12: Heat Transfer Equipment on-wards. can you give me the min requirments/specifications for the instruments used in the indirect bath heater? What is the water blowdown rate? I assume that the water will build up Na, Ca, Mg, etc. salts. What is meant by ‘Multiple return fire tube ‘ and when to use forced draft burner and its advantage over natural draft. We have 2 indirect water bath heaters in pressure reduction station, but the station stopped for 4 years, Is it required to do any test for the heaters such as the hydrostatic test for the bundle tubes of the heaters before operate it? Maintenance period for water bath heaters is Max. 5 years with 6 months regular inspections. If the Heater has been stand by for four year, I’d recommend RT on process coils and MT on fire tubes. First of all I recommend to remove the coil bundle and check the thickness of pipes, if it is ok the welded Jones should be full radiography and then you can do hydrotest for the bundle. For fire tube MT and checking of thickness is enough for the shell T joints need to be 10% radiography. There is a lot you can do. Test your glycol, A complete inspection, pull the coil bundle and fire tube, pit and thickness test, hydro test. Hello, I am having a lot of Operating and Maintenance (O&M) problems with these indirect bath heaters of a given manufacturer. Is there any material so that help me to identify some common O&M problems and possible solutions? My idea is to improve the reliability of these equipments by finding the root cause of the problems. I want to designe a bath heater for a pool. I need to consult. Recently we had incident (no harm) where we noticed black smoke from the gas fired water bath heater stack and fire at the exit of the stack. I need to understand that can this cause flashback/back fire and lead to explosion. Why is this happened. Is the fire only at the exit of the stack or fire travel all the way from burner to stack. Hi Chirstopher, We have been working closely with the UK gas industry to modernise indirect heating technology and the vales we have measured for efficiency range from 40% to 57%. What this value reports is the conversion of energy from fuel into a heated process stream, such as natural gas at a pressure reducing station. We also focus on how much fuel consumed related to overheating beyond process requirements which is a further 10-20%. Our efforts have been to optimise the intermediate heat transfer step using a two-phase loop Thermosyphon. We have 14 plants running on UK gas distribution networks with the biggest installation being 2.7 MW. Since we transport energy using steam at 40-80˚C (under vacuum) the thermal conductivity in the system is up to 25 X that of a traditional water bath. We have also focused on the control system since that’s key to reducing overheating losses, especially under highly transient loads. We have seen 90% process efficency over a range loads with control easily adapting in real-time to changes in heat demand. I would invite any of your readers who have an interest in indirect heater design to check out some of our papers https://www.sciencedirect.com/science/article/pii/S235248471730166X or to get in touch with us. Can any one explain me how to select the type of burner wheather natural draft or forced draft. What major criteria for selection of burner type. Where I have to refer for selection. Generally speaking atmospheric burners result in about 30% losses up the chimney but forced draft can reduce this to <10% if properly designed. It is usually better to use forced draft unless a) there is no access to power to run the burner fan b) the unit is old and designed for an atmospheric burner. If anyone on this thread has an incentive to reduce energy use from indirect heaters, please let me know. Our heaters are the fastest responding, most precise and efficient available. We would love to supply a project outside of the UK. I’m looking for a burner flame sensor which is used in pilot assembly of indirect water bath heater. The sensor does not supply adequatevoltageto operate a solenoid valve.